But what are you actually grateful for? It’s a question that could change your life. Backed up by rigorous research, the article below (excerpts from a Huffington post article), highlights the influence our state of mind has on our wellbeing. While you’re reading it, I encourage you to think about how this affects you as a person, a colleague, a boss, a trainer, a friend, a parent, a member of your community etc. If you believe, for example, that to get any work done, you have to put your nose to the grindstone (really? that image evokes blood! ), think again. Positive vibes aren’t just for hippies. While the article specifically focuses on gratitude, it’s not a stretch to think that being fulfilled & happy, leads to better, well, almost everything. Better employees. Better trainers. Better bosses. Better organizations. Better people. Negative attitudes are bad for you. 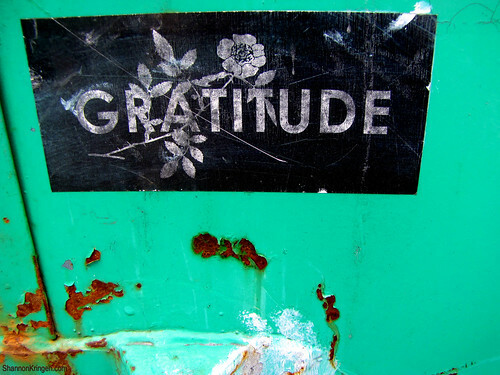 And gratitude, it turns out, makes you happier and healthier. If you invest in a way of seeing the world that is mean and frustrated, you’re going to get a world that is, well, more mean and frustrating. But if you can find any authentic reason to give thanks, anything that is going right with the world or your life, and put your attention there, then statistics say you’re going to be better off. In one study on gratitude, conducted by Robert A. Emmons, Ph.D., at the University of California at Davis and his colleague Mike McCullough at the University of Miami, randomly assigned participants were given one of three tasks. Ten weeks later, participants in the gratitude group felt better about their lives as a whole and were a full 25 percent happier than the hassled group. They reported fewer health complaints, and exercised an average of 1.5 hours more. There’s an old saying that if you’ve forgotten the language of gratitude, you’ll never be on speaking terms with happiness. It turns out this isn’t just a fluffy idea. Several studies have shown depression to be inversely correlated to gratitude. It seems that the more grateful a person is, the less depressed they are. Ocean Robbins is an author, speaker, facilitator, movement builder and father. To learn more about his work or to get a free copy of his mini-book “The Power of Partnership,” visit www.oceanrobbins.com. Are you consistent with yourself? I hope not.